The recently-unveiled Microsoft Lumia 640 is a mid-range Windows smartphone which stands apart from the previous Microsoft Lumie 6-Series devices like the Lumia 630. The device features an HD display and comes in single-SIM and dual-SIM variants. The display of the Microsoft Lumia 640 is better than the ones used on the older 6-Series devices, while the device itself is larger. The 5-inch IPS LCD display has an HD resolution of 1280 x 720 pixels with 294 pixels per inch. Microsoft Lumia 640’s multi-touch screen is protected by a scratch-resistant Corning Gorilla Glass 3. Microsoft provides an upgraded 8-megapixel camera with F2.2 aperture at the rear of the device and a 0.9-megapixel shooter on the front. The Lumia 640’s main camera, which now comes with LED flash, can record full HD (1080p) videos at 30 fps. Microsoft Lumia 640 runs on Windows Phone 8.1 operating system for now. But users will be able to upgrade the phone’s software to the upcoming Windows 10 mobile platform later this year. Processing power is supplied by a quad-core Snapdragon 400 chipset clocked at 1.2GHz, supported by a RAM of 1GB. Internal storage is 8GB, with this being expandable up to 128GB using a microSD, microSDHC or microSDXC card. Power for running the device is provided by a 2500mAh battery, capable of delivering more than 26 hours of talk time. Available in single-SIM and dual-SIM models, the Microsoft Lumia 640 will have models supporting 3G and 4G networks. The device comes with a range of connectivity options, including USB 2.0, Bluetooth 4.0, NFC, DLNA and Wi-Fi b/g/n. It supports Mobile Hotspot, tethering and over-the-air (OTA) sync. Microsoft Lumia 640 also supports GPS, A-GPS, Glonass and Wi-Fi positioning. It is preloaded with online services such as Facebook, Twitter, Google+ and YouTube (upload). Microsoft Lumia 640 will be available in different colours, including black, white, cyan and orange. The official release of the device is scheduled for April, with the 3G model expected to cost €140 and the LTE model, €160. Microsoft Lumia 640 is not available in Nigeria, it will start shipping in April, 2015 in some countries. We currently have no information on pricing and availability for Nigeria. 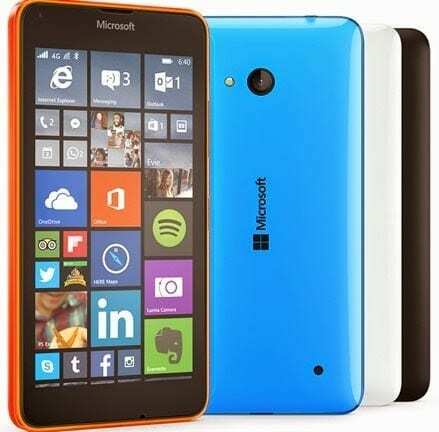 Microsoft Lumia 640 Price in Nigeria should range from N28,000 to N38,000 at launch.